I wish to draw your attention to an excellent piece on the Chester Cycling blog, entitled Partition is a panacea. There, the author argues that the provision of safe and attractive cycling infrastructure would not only be a boon for personal mobility in the UK, and good for the environment and public health, but that it fits in exactly with the widely-perceived, in many political circles, need to actually spend public money to generate growth in the economy: the Keynsian theory, which suddenly (over the last few months, as the sustained nature of the recession has become evident to all) has become popular from left to right on the political spectrum. Those on the right tend to emphasise the "investment" aspect of such expenditure, in terms of its proposed future benefits to economic efficiency, rather than the Keynsian "stimulus" aspect. Nevertheless, the agreement over the kind of thing that needs to be done, in practice, seems widespred. But there is, it seems from statements by government ministers, a problem with this investment, aside from whether we can afford it or not: "red tape". It suddenly seems to be the idea of the moment that "red tape" needs to be swept away to allow government, in collaboration with the private sector, to build the infrastructure that we need. According to George Osborne today, the planning system is too cumbersome and it is getting in the way. In fact, I agree with this, but on, I suspect, completely different grounds to the ministers who have been talking about it, and the kinds of projects I am thinking about are quite different. I am thinking not about a new runway for Heathrow, but about modest changes to the streets of London. But these things are all related. Let's face it, if we can't get kerbs and signs right, what chance have we with airports and high speed rail? So, on Friday I was looking at a little street in Brent, just north of Harrow Road, called Hazel Road, with a consultant and some council officers. This street has been closed-off to through-traffic for some years. There is a pedestrainised area by a small playground. We noted that many cyclists were using this street as a bypass to a congested junction on Harrow Road. Good on them, why shouldn't they? This is what "filtered permeability" is all about: giving cyclists easier journeys than other road traffic by letting them use routes that are blocked to motor traffic, in the process, separating them from motor traffic, for the good of all. But unfortunately, cyclists are not officially allowed to pass through the pedestrainised section of Hazel Road. The meeting was convened to consider how to change the street to make it better and regularise the cycle route through here. A few minutes study of Hazel Road and all could agree that esssentially nothing needed to be done to this street apart from a bollard needing renewing, signs at either end bearing cycle-pedestrian shared space symbols needing to be put up, and dropped kerbs needing to be put in. It should cost only a few hundred pounds. A couple of workmen could do it in an afternoon. But in reality, in UK town planning, things are never as simple, or as cheap, as this. For this road has has a "traffic order" put on it that excluded all wheeled traffic from the pedestrianised section, and it will need another traffic order to create an exception for bikes. That means that Brent has to go through an expensive legal procedure. Public notices need to be issued, adverts need to be placed in obscure papers that nobody reads (and that exist only for the purpose of having these public notices that nobody reads placed in them), consultation documents need to be sent out to all and sundry, lawyers need to be paid, and officers must get bogged down in masses of paperwork, all, in effect, to allow a couple of workmen to come out for a morning with a pick and shovel to relay about eight kerbstones. It's a situation that the Charles Dickens of Bleak House would have revelled in grimly satirising. As a result, the cost of this tiny, modest change to the road network, and to the cycling infrastructure in London, will be thousands of pounds. Multiply this by the many other small changes that are needed all over London to create even the most rudimentary cycling network, and you can readily see why such a project seems unaffordable. And the great worry of council officers is that if the proposals are slightly ambitious, involving changes to parking or motor traffic flow patterns, then there could be quite a few objections in a public consultation, and councillors may take heed of these, and block the scheme. Then all the money spent on it will have been wasted. So we have a crazy situation. Leading politicians are saying we need to spend money on new infrastructure, not merely for the reason of actually having the infrastructure, but for the reason of actually spending the money to revive the economy. Yet when we ask for small changes to create better cycling connections in London, and improve the streetscapes for everybody, we are told that there is no money because we are in a recession, and money is tight. But in fact, there was no money for these changes when the economy was booming either (or they would have been done by now). The money to change Hazel Road comes from the "Biking Borough" grant awarded to Brent by Boris Johnson. It is around £300,000 to be spent over three years. But at least half this cash is being spend on promotional measures to encourage cycling, because that is what should happen in Biking Borough schemes, according to TfL. That leaves about £50,000 per year to be spent on infrastructure, for three years. That means two or three very small-scale schemes like Hazel Road per year, plus maybe a few more cycle stands. This is a minuscule rate of progress, even if all goes according to plan, and nothing gets objected to. A mad system of red tape, legalism, and excessive emphasis on expensive public consultation over small matters currently strangles attempts to provide for cycling in our cities. Some of the consultation thing comes from legal judgements that stem from legislation put in during the Thatcher era. 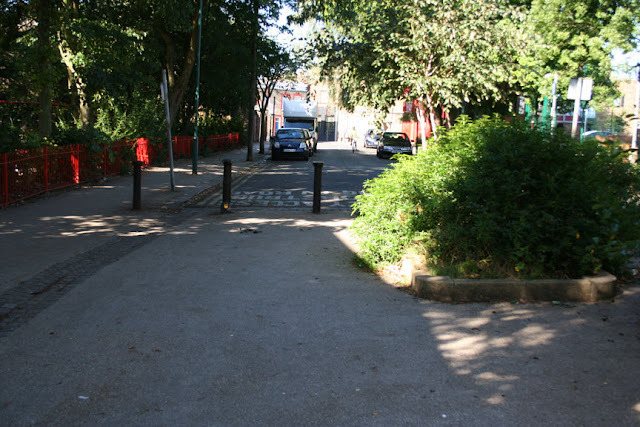 The "Primrose Hill Judgement" of 1995 against Camden Council, where Camden attempted to introduce controlled parking in that well-heeled (and well-wheeled) district, without, according to a judge, adequate consultation, along with other developments and emphases by local government ministers in successive governments, has fostered an idea that residential roads "belong" to the people who live on them. It has become very difficult for councils to put in schemes on such roads with which a majority of residents disagree. And this makes strategic planning for cycling extremely difficult, because cycle networks will be, in part, on minor roads, but if each section of network can potentially be blocked by a vociferous group of nimby residents who see only their own short-term interests, and don't understand the strategic reasoning, then it is no wonder that council officers are very loth to propose anything remotely ambitions, beyond painting some cycle symbols on a road. So I agree with George Osborne. The infrastructure we need for both growth and environmental benefit is being strangled by foolish bureaucratic rules imposed by government. But at this level, the level of kerbstones on tiny residential streets, I don't think this problem is on the radar of ministers. It needs to be, if councils are to deliver any sort of cycling infrastructure, and deliver it within sensible budgets. I am pretty sure the reason I have no idea what is said in this document is not just because English is my second language. It's not just cycling: the cost of rolling out a zebra crossing goes more in legal process than paint. Sometimes there is a lack of imagination within the council. You don't need a traffic order to paint the road surface a different colour, and some actions might not need to be advertised and tested in the same way. Instead of changing the TRO here for the road could the footway be made shared use, through a less onerous process? I can only say that the officers thought a new TRO would be needed. I don't see that changing the status of the footway only would make sense – we don't want cyclists there. Quite possibly. We found that the City of London was spending 2/3rds of the money it got from TfL for LCN on something other than tarmac and concrete. Possibly that was due to bureaucratic and legal procedures, though don't have any info to test that. Considering the additional legal legwork required at present for even minor changes to the road network makes the rather extreme measures taken to accommodate single-occupant private car travel seem even more impressive (in a depressing sort of way). You write: "...this makes strategic planning for cycling extremely difficult, because cycle networks will be, in part, on minor roads, but if each section of network can potentially be blocked by a vociferous group of nimby residents..."
The vociferous groups of nimby residents might change their tune a bit if they understood how much more money their houses could be sold for if their neighbourhood was in a Home Zone. I am told that in Holland, houses in woonerfen sell without even being viewed. You also write: "... it is no wonder that council officers are very loth to propose anything remotely ambitious, beyond painting some cycle symbols on a road." As a first step, can you see anything wrong with this? Yes, it would be a waste of money. And if the waymarking of routes was paid for by sponsorship ...? As often, David, a thoroughly informative piece. Thank you for writing it. I do think it is important for us advocates of cycling to work with Borough Cycling Officers. They are sincere in wanting to do as much as they can for cyclists, but sometimes, what they are able to do, is maybe not as much as we would like. Still, Going Dutch is about a journey, ultimately, a direction of travel, with a clearly defined destination: we would not have failed if we don't get there with a single stride. Great stuff, David. This is the first time I've heard a plausible reason why Simon Parker's London Cycle Map proposal (www.cyclelifestyle.co.uk) might not be viable. It's sad, though, that the problem comes not from anything internal to Simon's idea, but to the diffuse cultural phenomenon you've eloquently identified: "a mad system of red tape, legalism, and excessive emphasis on expensive public consultation over small matters currently strangles attempts to provide for cycling in our cities". On the subject of Nimbyism, and public consultation, I recall an exchange of comments on a blogpost concerning Woonerven about a year ago. Apart from the other characteristics of a Woonerf, you could achieve quite a lot towards a network of safe, quiet, traffic calmed routes if you were to view a residential street as purely a destination, and not as a thoroughfare. If you can’t come in one end and out the other, you can’t use it as a bypass, a rat-run, or a short-cut, so the incentive to drive fast and aggressively is taken away. It is certainly a feature of many larger-scale modern housing developments – there are many of these in the area around Aldershot, Camberley, Farnborough in Hampshire for example – that the estate will comprise a form of ring-road, with the housing all inside the ring and giving onto a series of culs-de-sac. A bit like spokes of a wheel but with no hub in the middle. Nothing, on wheels or on foot, can actually pass through the diameter, because all the gardens are contiguous. That of course is not entirely satisfactory because while it may have resolved the issue of safe streets for children to play, they still have to be ferried the long way around in a car whenever they are actually going anywhere. Surely that could be easily fixed, on new developments, by linking the spokes by footpaths and cyclepaths which are bollarded or not wide enough to admit a car. Apparently, (so the earlier discussion went) this can be viewed with considerable hostility, especially by older residents. They fear, or are irritated by, noisy kids (or worse) passing their front doors along such paths. For some reason they do not fear full blown roads – presumably they associate cars and drivers with respectability and law-abidingness. I can imagine that also the police don’t much like situations where suspected wrong-doers can evade them by running or riding down an alley that they can’t get their patrol car into. The notion that perhaps they should stay fit enough to run after them, or that the plod could mount two wheels as well, does not seem to have much traction. The views of such residents will likely find sympathy in the pages of the Daily Mail, and so will gain more thorough airing than any supportive views. Your example in Brent is of course already there, having been a thoroughfare at one time, but possibly some resident would argue for it to be closed entirely, or barriered in such a way as to make it hard or even impossible for hoodies on MTBs, on their toes from the long arm of the law, to slip away unhindered? Is it possible for councils to save money by economies of scale if they do a number of traffic orders at the same time?